Mike Arbaney’s home’s architecture and decor is a ski-bum-guy-house, a throwback to the days of a more raw Crested Butte, reminiscent with posters of the resort’s ski runs and events, lighted beer signs, and the notorious leg lamp in the window. It is, in a breath, unpretentiously refreshing and nostalgic of a time when neighborhoods were intact with down home local friends making their way through the seasons and dirt streets. The coffee table is covered with stacked issues of motorcycle and hotrod enthusiast magazines, fodder for any discerning motor-head with a penchant for fixing vintage gas-powered street machines, some of which sit magnificently out in Arbaney’s front yard. Basalt was a pretty small town back when he was growing up. Mike’s senior high school had only 32 graduates in his class of 1995. As a child, he and his buddies did anything and everything that had to do with being outside—building forts and being boys. His father and uncle worked as ski instructors at Snowmass the very first year the resort opened, and Arbaney did a lot of skiing from the time he was three years old. He also went hunting and fishing through his growing-up years in the Roaring Fork valley. With a sparse work schedule, Mike found plenty of time for the slopes. “When you’re only working ten hours a week you can ski a lot,” he says with a big grin that you can imagine encrusted with ice from faceshots in powder. A few years ago, Mike bought a parcel of land in Crested Butte South to fulfill his goal of building his dream house. “ Small house, giant garage, big fancy kitchen,” he describes, his hands waving to express the size of a huge garage to shelter his vintage metal babies. He pulls out blueprints of a massive building he calls his Garage-Mahal that will hold four cars and a bunch of motorcycles. He’s already well on his way with a plentiful collection of antique cars and motorcycles. “My dad has always been into motorcycles and hotrods, so I grew up with it. I remember sitting on the back step of my house when I was a kid, polishing aluminum parts for his 1951 Indian motorcycle. When I was 14, my dad found a 1942 Harley in Naturita and we bought it for $500,” he says of the screaming deal. Arbaney’s wanderlust seems to go hand in hand with his affection for beautiful vehicles. It gives him a sense freedom and he aspires to travel a lot more in the near future. About five years ago, he headed off to India with Steve Belz, a former Crested Butte artist. The duo flew into Delhi and bought two Royal Enfield motorcycles. “They’re a classic cycle,” Mike explains, “and we toured through the Himalayas on them. We went over a pass that was 18,000 feet and we got to see all the Buddhists temples on the way. Intense is a good way to describe India.” He uses his uncle’s imagery of his own experience. “If you want to know what it’s like before you get there, just remember back when you were a kid and you kicked the biggest ant pile you could find and millions of ants came out going in all directions for no rhyme or reason. India is just like that only with people.” The bikers cruised through non-tourist areas where Arbaney felt the real freedom of a motorcycle. Recently, he took a few weeks to motorcycle around Alaska after flying into Anchorage. “I’d never been to Alaska and it’s always been someplace that’s fascinated me. I rented a motorcycle and went wherever the weather was nice, all over the state. The second part of that trip was rafting down the Kisaralik River, near Bethel, in the western part of Alaska,” Mike says of the river run he did with close Buttian friends. “There are ten different species of fish in that river and we caught all ten. It was cool to see those glaciers and big mountains and it’s cool to be in a place that hasn’t been screwed with.” Mike feels that Alaska has nature as it’s supposed to be. Mike attended that class, interpreting the famous painting in his own style—a panorama of town dropped into the forefront with swirling dark blue night skies dotted with stars. It got him switched from watercolors to acrylics. 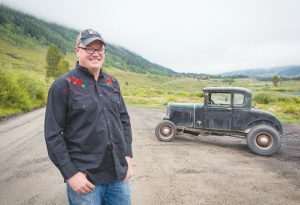 Although traveling to foreign places is high on Mike’s list, he’s not leaving Crested Butte too long for unknown parts. In a perfect world, Mike plans on starting to build his Crested Butte South house this coming spring, with its enormous garage and big kitchen where he can bake his mouth-watering pies. “I want a big fancy kitchen because I like to cook and make fancy pies.” He pulls out his phone with photos so scrumptious you can almost catch the aroma, from his peach pies to Bronco-themed pies, replete with the Bronco logo.